We are responsible for cleaning drains on the public road. 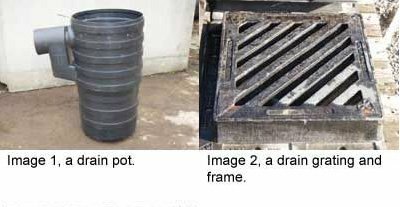 A drain is made up of an iron grate set in the road with a pot underneath (see images 1 and 2). It has an outlet pipe attached to take water into the main drainage system. The pot collects any debris, leaves, litter, soil and rubbish that is washed off the road ensuring that the collecting pipe doesn't become blocked. Please report broken or missing drain covers to us immediately using the general highways form and giving a precise location as possible. A culvert is a pipe-like structure that channels the flow of a stream beneath a road. 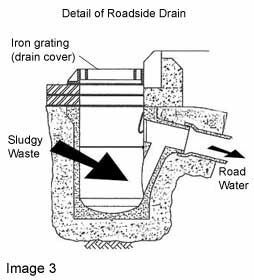 What is the difference between a drain and a culvert? A pipe that carries surface water is often referred to as a drain. A culvert normally refers to a structure larger than a pipe but smaller than a bridge of the type where a brook, stream or river flows beneath a road. We have about 160,000 drains located at the side of roads. They are cleaned at least once every two years, however in known problem areas and on major roads we clean them more frequently either annually or twice a year. We assess the condition of our drains every time they are cleaned and adjust the frequency so that we can target those that require more regular cleaning. This may mean that those in good condition are cleaned less frequently. We don't clean drains in car parks, blocks of flats or private roads. We use high-pressure hoses to blast through the pipes to try and clear a blockage and a root cutter attachment to clear tree roots. If we aren't able to clear the blockage we use a camera to locate the problem. Often the only solution is to dig the road up and replace the pipework. A tanker with a suction hose takes an average of five minutes to clear each drain. Please help us by not tipping waste such as concrete and oil down the drains as this can block the pipes and contaminate ditches, streams and rivers. If you know of someone who tips waste in to a gully please let us know by filling in the general highways reporting form. Sometimes we need to clean the drains but can't because cars are parked over them. If we need to clean the drains in a road where there are normally cars parked, we will put signs up showing the planned cleaning dates. Please help us by parking elsewhere during this period. The debris and sediment that we collect is taken to a state of the art drain waste-recycling centre where 60% is recycled. Grit and sand is removed from the waste and used in asphalt and concrete production and the cleaned water is used for washing gravel. More information on excess water can be found on our flooding pages.